NLRB Rules Graduate Students Are Employees With The Right To Unionize : The Two-Way The 3-1 decision by the National Labor Relations Board reverses a 2004 ruling and opens the door to union drives at private universities across the country. 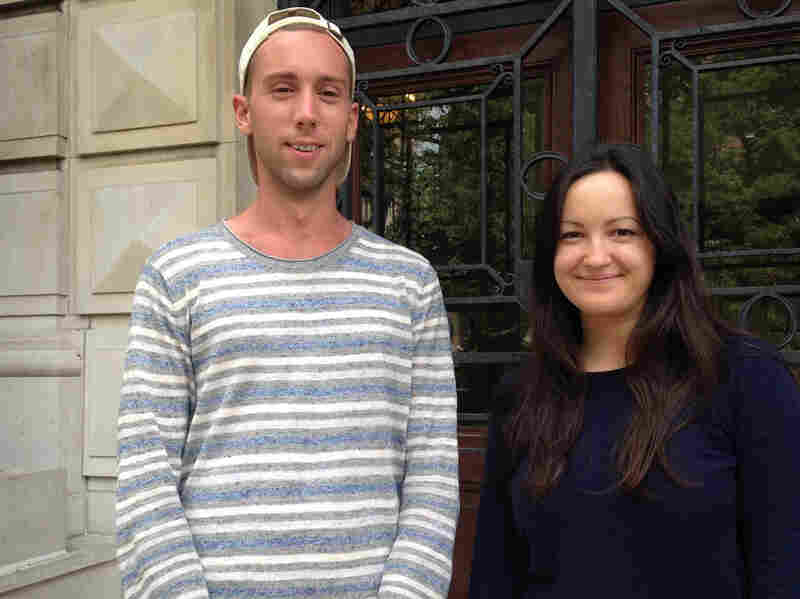 Ian Bradley-Perrin (left) and fellow graduate student Olga Brudastova have been active in the campaign to unionize grad students who work as teaching and research assistants at Columbia University. The National Labor Relations Board ruled 3-1 Tuesday that graduate students working as teaching or research assistants at private universities are employees with the right to collective bargaining. The decision comes in response to a petition filed by the Graduate Workers of Columbia-GWC and the United Autoworkers Union, which has been seeking to represent grad student assistants at Columbia University. NPR's Yuki Noguchi reports that "only a small fraction of graduate students at public universities are currently represented by unions — but the decision governing private university students is expected to lead to unionization efforts that could organize tens of thousands more." The NLRB had long held that students who teach or research at a private university were not employees covered under the National Labor Relations Act, Yuki reports. That changed in 2000, when the board decided a case in favor of students, and changed again with another ruling four years later. Now the NLRB has reversed itself yet again. In Tuesday's decision, the board majority wrote that the 2004 ruling "deprived an entire category of workers of the protections of the Act, without a convincing justification in either the statutory language or the policies of the Act." "The Board has the statutory authority to treat student assistants as statutory employees, where they perform work, at the direction of the university, for which they are compensated. Statutory coverage is permitted by virtue of an employment relationship; it is not foreclosed by the existence of some other, additional relationship that the Act does not reach." The decision was signed by NLRB Chairman Mark Gaston Pearce and members Kent Y. Hirozawa and Lauren McFerran. In his dissent, member Philip A. Miscimarra argued that the relationship with Columbia University "is primarily educational, and that student assistants are not employees." He called the majority's decision ill-advised. "While we are reviewing the ruling, Columbia — along with many of our peer institutions — disagrees with this outcome because we believe the academic relationship students have with faculty members and departments as part of their studies is not the same as between employer and employee. First and foremost, students serving as research or teaching assistants come to Columbia to gain knowledge and expertise, and we believe there are legitimate concerns about the impact of involving a non-academic third-party in this scholarly training."